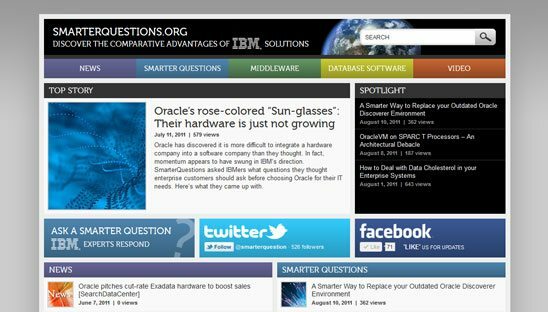 SmarterQuestions – Discover the comparative advantages of IBM solutions. Ask smarter questions. We were very honored and excited to design a wordpress blog for IBM. We went with a very clean and colorful design with separating each of the main blog categories with its own color titles. Wanted each category to have it’s own feel and own sections (with spotlight and top story dedicated to each one) . This wordpress site is also using our very own WP Social Toolbar plugin. We also created thier custom Facebook design using the same WordPress system. The featured and regular post all dynamically change when IBM changes updates the blog post. Added a share section in footer which includes Tweet, Google +1 and Facebook recommend buttons.